Rebecca (1940): Dir. Alfred Hitchcock. Written by: Robert E. Sherwood and Joan Harrison, from an adaptation by Philip MacDonald and Michael Hogan. Based upon the novel of the same name by Daphne Du Maurier. Starring: Joan Fontaine, Laurence Olivier, Judith Anderson, George Sanders, and Nigel Bruce. Unrated. Running time: 130 minutes. Coming on the heels of the massive Gone with the Wind, Alfred Hitchcock’s first and only Best Picture-winning film represents just a fraction of the director’s talent, and for my money, it’s the superior film. Boasting riveting suspense and even horror elements typically unseen in the Best Pictures, Rebecca also succeeds as a character-driven drama. We see the film mostly through the eyes of an unnamed orphan woman, who encounters the enigmatic Maxim de Winter while tending to a rotten employer. Smitten, and perhaps craving more from her life than her current career can offer, our heroine marries the mysterious aristocrat. Soon, however, she finds the de Winter mansion may be haunted by the presence of Maxim’s first wife—on every conceivable level. Hitchcock, always a master at holding an audience’s attention, evokes a Gothic feel from the mansion and its surroundings, in a manner that brings to mind everything from Bluebeard to Jane Eyre to Beauty and the Beast. Yet Rebecca feels like its own entity as well—populated by characters that only hint at Maxim’s shrouded past. Lighting and set design do wonders to enhance the film’s brooding atmosphere. But the film remains grounded in the human element, also a strength of Hitchcock’s films. Laurence Oliver adds levity to a character who only really comes into view after a key revelation (which I will not spoil here). 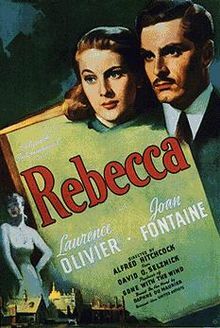 And Joan Fontaine acts as our window into this strange world, and confronts the horror of failing to replace a beloved memory. My minor quibbles with the film stem mostly from the implications of certain plot revelations, and from certain character relationships that are taken for granted. But don’t let that deter you. It’s a fascinating picture, prophesying a string of films that would never again be rewarded by the Academy.